Before we go into the tasks of the central bank president, we must firstly state the organization for the central banks. Although it may change from country to country, the working system is almost the same. 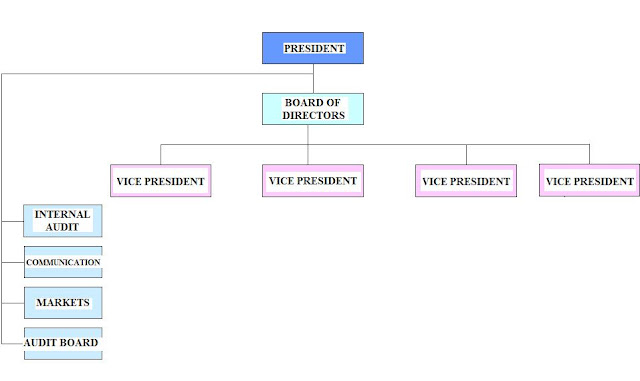 To understand it, Central Bank of Turkey (TCMB)’s organization chart is shown in the following. In this organization it is clearly seen that president is above the board of directors. This means that the decisions which are taken in the board meetings should be approved by the central bank president. This style of organization makes the presidents more powerful in the economic decisions. Further in some economies the presidents’ names are standing above the central banks. For example there is a saying in US that says “Greenspan Effect”, not FED effect. Alan Greenspan, who had been managing FED for 18 years , had been standing above FED and his speeches were used for the forecasts in the economies of the other nations. Besides these, some of the advertisement companies or banks had used his speeches for their advertisement campaigns to persuade their customers. “The Governor shall, in the capacity of the highest executive officer, administer and represent the Bank within the country and abroad. The Governor shall ensure the enforcement of the provisions of this Law and the decisions taken by the Board. The Governor shall take appropriate measures in order to carry out the duties with which the Bank is entrusted by this Law, and to make proposals to the Board on such measures whenever the Governor shall deem necessary. The tasks of the president of TCMB are shown above. In this article the duties about the management of the bank was tried to be shown. However the duties of the president are more than the management of the bank. It is seen clearly that, in the speeches of the president there are many advices and warnings for the sake of the economy. The president should be always dealing with the recent happenings in the economy. These may be the opening of a new stock market or the success in inflation targeting. Decrease the monetary supply; it sells bonds to the financial intermediaries. Although the above mentioned transactions are seen to be very easy, these should be decided very rapidly in order to protect the situation of the economy. This rapidness is the result of the determination level of the central bank’s president. Open market transactions can be made every day regarding the situation of the economy. But on the other hand the other two important transactions (determining the discount rates and declaring the reserve rates) should be made very carefully and after many sophisticated analyses. The research units and the other units in charge of the economic activity must provide recent reports to the president. The experience of the president of central bank becomes to be very important at this point. He or she must understand the general view from the reports that he is given. David Sicilia and Jeffrey Cruikshank, The Greenspan Effect: Words That Move the World's Markets, US, Mc Graw Hill, 2001, p. 1. 1211 numbered Act of Central Bank, Article.26. Paul A. Samuelson, İktisat, İstanbul, Menteş, 1970, p. 346-351. Başkent University, “Merkez Bankası”, http://www.baskent.edu.tr/~gurayk/finpazcuma4.doc.